Russell Hodge from Pirie Smith pays tribute to Howard Shatto, the father of dynamic positioning, who died earlier this month aged 92. 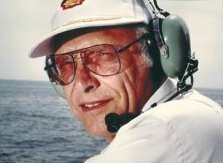 An ex Marine Corps officer and Yale graduate, Howard Shatto began work for Shell in 1946 where his first job was to convert a former swamp rig into a diesel-electric offshore unit to work in the Louisiana Main Pass off the Mississippi Delta. After working on control systems for gasoline plants and oilfield automation Shatto was assigned to the Marine Division in Los Angeles where he became involved in what was eventually to become the first dynamically positioned offshore vessel: the Eureka. The vessel was originally designed to be manually positioned as was its predecessor CUSS 1 which would drill in 11,000 ft off California for the Mohole Project, which would eventually lead into the Deep Sea Drilling Project. The Eureka was to drill in shallow water and Shatto disagreed that the accurate position keeping required could be accomplished manually. On a long car journey from Ventura to Los Angeles Shatto worked out how he could apply the lessons learnt during his years in plant automation to ship position control. Against the opposition of some of his management he was eventually able to persuade them to commission an automatic system based upon his ideas from Hughes Aircraft. Two months after CUSS 1 drilled Mohole, the Eureka began operation in May 1961 and dynamic position keeping, as it came to be known, was born. Today over 3,000 ships are fitted with DP systems, no one is exactly sure of the number. In 1967 he was transferred to The Hague where he led the dynamic positioning system development for what was to become the first dynamically positioned oil drilling rig for Shell in 1971: the SECDO 445. Not restricted to innovation in dynamic positioning he was involved in numerous other offshore projects over the years and even renewed his association with Hughes Aircraft in the development of MOBOT, the predecessor of today’s remotely operated subsea vehicles (ROV). Howard was a member of SNAME and for many years served on the Technical and Engineering Committee of the Joint Oceanographic Institution Ocean Drilling Program. In the late 1990s he was instrumental in setting up the DP Committee of the Marine Technological Society as a forum for those involved in dynamic positioning development to share ideas, technology and experience. He was Emeritus Chairman of the committee until his death.